My spouse, Anne, and I recently bought a hundred year old house in Bridgeport, Chicago. In its renovation, we have decided to take out its drop ceilings. With all my processes of art creation and life activities, I am committed to reusing as many materials as possible. These tiles are not recyclable. They are made of fiberglass, mineral wool and paint. 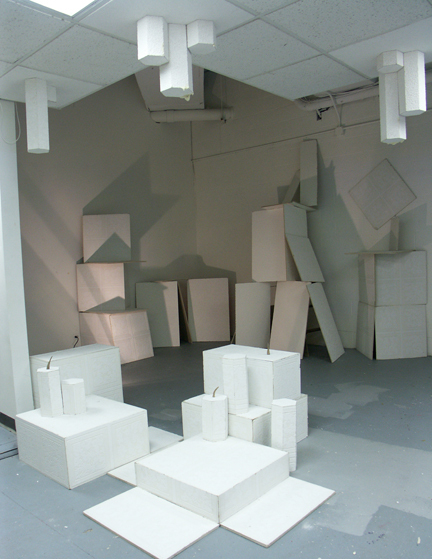 Rather than throw them out, I have reconfigured them into these nature-referencing architectural forms. 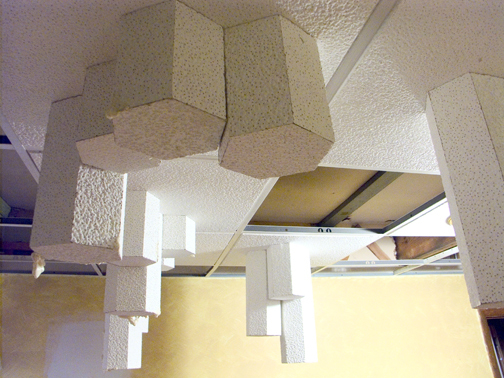 I am transforming the 130 ceiling tiles into honeycomb structures and installing them in public space ceilings such the recent exhibitions at the Beverly Arts Center and the Pedway Open Studio at the Cultural Center in Chicago. I cut the tiles and form the sides into hexagonal boxes. 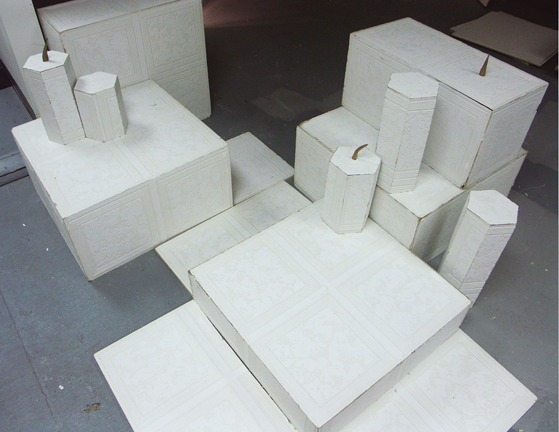 I glue these boxes together and attach them to another tile. The “remodeled” tiles are hung in place of a tile in a ceiling grid or attached to tomb-like forms on the ground. The physical product and process reference our strange relationship with the natural world. Anne coined the term Faketure (fake nature) six years ago to help describe this phenomenon. I look at the honeycomb form as magnifying the unnatural and natural ways of making modular structure in architecture. We, like bees, organize our residences along a pre-determined pattern. Like a wasp’s nest, I am attaching a part of my home onto an existing structure. In future installations, the work will be installed like stalactites and stalagmites, configured specifically to each space. 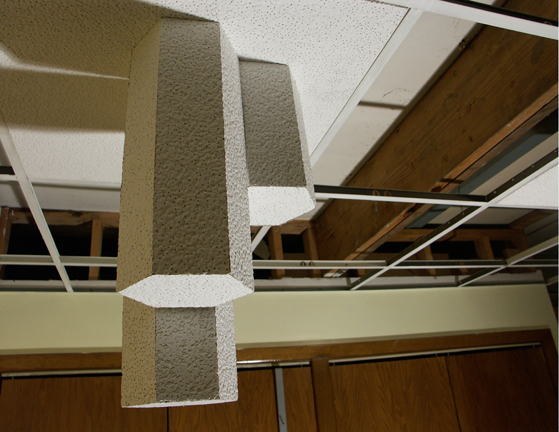 The ceiling grid may be installed easily in spaces without an existing drop ceiling. There will also be an audio element composed by artist Danielle Martin. She will be synthesizing bee-buzzing and distorted conversations from two sisters discussing the recent phenomenon of disappearing bees.